President of Uzbekistan Shavkat Mirziyoyev will pay his first official visit to U.S. on May 15-17 at the invitation of U.S. President Donald Trump. After a bilateral meeting, the two presidents are expected to make a joint statement: “Uzbekistan and U.S.: Start of a new era of strategic partnership.” Experts say Uzbekistan will avoid foreign policy imbalances. Spokesperson of Uzbek President Komil Allamjonov called Mirziyoyev’s visit historical and specified the date of the meeting with Trump – May 16. “Presidents Trump and Mirziyoyev will resume bilateral strategic partnership between the United States and Uzbekistan. They will discuss Uzbekistan’s progress in implementation of important reforms, enhancement of trade and investments, as well as settlement of regional security issues, including stabilization of situation in Afghanistan,” Allamjonov said. Shavkat Mirziyoyev is expected to hold bilateral meetings in the Congress, Defense Department and Department of State. A package of documents will be signed to boost bilateral relations in various areas. Earlier, Shavkat Mirziyoyev and Donald Trump met on sidelines of the Riyadh Summit 2017 of Arab-Muslim countries and U.S. in May. 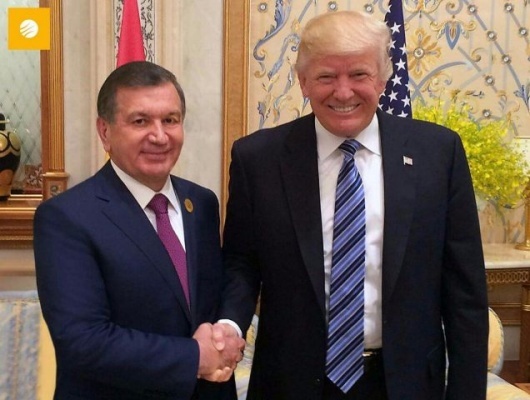 According to the Uzbek Foreign Ministry, Trump “hailed” process of reforms conducted by Mirziyoyev. In September of 2017, the new president of Uzbekistan paid his first visit to U.S. – he attended UNGA in New York. Documents for $2.6 billion were signed during the visit, particularly agreements to implement joint projects with General Electric, Honeywell, Caterpillar, Boeing and others. Besides, an agreement was signed to establish a branch of Webster University in Tashkent, the first full-fledged branch of the American university in CIS. In New York, the Foreign Trade Ministry of Uzbekistan opened a house of commerce to boost export to U.S.
Talking to EADaily’s correspondent, Alexander Vorobyov, a research fellow at Oriental Studies Institute of Russian Academy of Sciences, said the Uzbek president’s visit to Washington is in the focus of attention of Russia and the countries neighboring Uzbekistan. The point is that Uzbekistan has increased its influence in the region during the last one and a half year, improved relations with neighbors, intensified trade and economic relations with them, more actively involved in Afghan settlement. Within that period, Uzbekistan has significantly improved its relations with Russia in all possible areas. However, in relations of Moscow and Washington, where President Mirziyoyev is to travel soon, the level of mutual distrust and claims is as high as it was after Cold War. Therefore, what is intriguing about the upcoming visit is whether Mirziyoyev will manage to keep the balance between interests of Russia and U.S. It is not easy to conduct talks with Washington that has a rich arsenal of instruments to influence policy and economy of any country. So far it appears that the president of Uzbekistan will find the “golden mean.” Tashkent has been building its foreign policy line with a high responsibility and guided by its own interests in the relations with Moscow, Beijing, Astana or Washington. Uzbekistan seeks a stronger political and economic partnership with Moscow to improve its positions in the region and get economic benefits. Last month Kandymsky gas processing plant worth $3 billion was put into operation in Uzbekistan. It is a joint project of Uzbekneftegaz and Russia’s Lukoil. It was reported in April that Tashkent plans to sign an NPP construction project with Russia. For Washington, Uzbekistan is an important country due to its influence in the region, current and potential role in Afghan settlement. Noteworthy that Mirziyoyev is visiting Washington at the invitation of Trump, who invited him to pay an official visit to U.S. yet in December. This March, he repeated his invitation, which means that U.S. respects economic, political and other interests of Tashkent. Reportedly, the two presidents will sign documents to boost cooperation in trade and economic, investment and other sectors. This meets Uzbekistan’s interests and plans to increase economic growth and export opportunities. Farkhod Tolipov, Director of Bilim Karvoni (Knowledge Caravan) private scientific and educational center, told EADaily Tashkent will avoid imbalances in foreign policy. Speculations are not justified here. The country consistently works to develop relations with various countries. The president travelled to Russia, China. He is preparing to visit United States and then EU. “They are building a normal cycle of cooperation with the world’s countries. It is wrong seeing a hidden attempt to balance between U.S. and Russia with a turn to Washington,” Tolipov said. He sees certain logic in these ties and efforts to establish relations. As to Mirziyoyev’s visit to U.S., one should not forget that to understand the logic and American-Uzbek relations, it is necessary to study them since the very first days of Uzbekistan’s independence. Diplomatic relations of the two states were established in 1992, whereas embassies were opened in Tashkent and Washington a year later. President of Uzbekistan Islam Karimov’s first visit to U.S. was in 1996. In 2002, Uzbekistan and U.S. signed an agreement of strategic partnership. Russia and Uzbekistan have a similar agreement. The situation is equal in this sense. “Uzbekistan builds relations with every country stemming from specific comprehension of its interests in every direction,” Tolipov said. He recalled that the relations of Uzbekistan with Russia and U.S. had ups and downs, nuances and even moments worth to be criticized. Bakhtier Ergashev, Director at Tashkent-based Ma’No Center of Research Initiatives, sees no “underground currents” in the visit of Shavkat Mirziyoyev. “U.S. means investments, cooperation in settlement of regional issues. Therefore, partnership with U.S. is very important for Uzbekistan to achieve settlement of security issues in the region, development of the region’s countries and opportunity for growth and economic development. President travels to U.S. to get answers and agreements related all these areas,” Ergashev told EADaily. He believes that Uzbekistan’s foreign policy, especially in the region, is very active and needs logical continuation. A very serious conference on Afghanistan was held in Tashkent recently and U.S. was one of the partners organizing the event. Now it is time to shift to the next level of settling these issues. “I am speaking about political, security, economy and investments related issues. All these issues will be discussed and I anticipate very good decisions. The sides are ready for it,” Bakhtier Ergashev said.